You know the score… what are the “classics” that you expect to see at every single Glastonbury festival? Well, let’s make it interesting. As Glastonbury rapidly approaches its 50th anniversary, we find that the weekend of shenanigans at Worthy Farm in Somerset has become a permanent fixture on the British calendar. In fact, the festival has become so entrenched in the culture, there are certain events or sights that you can depend on every June. So, Radio X thought - why not make a game of it? 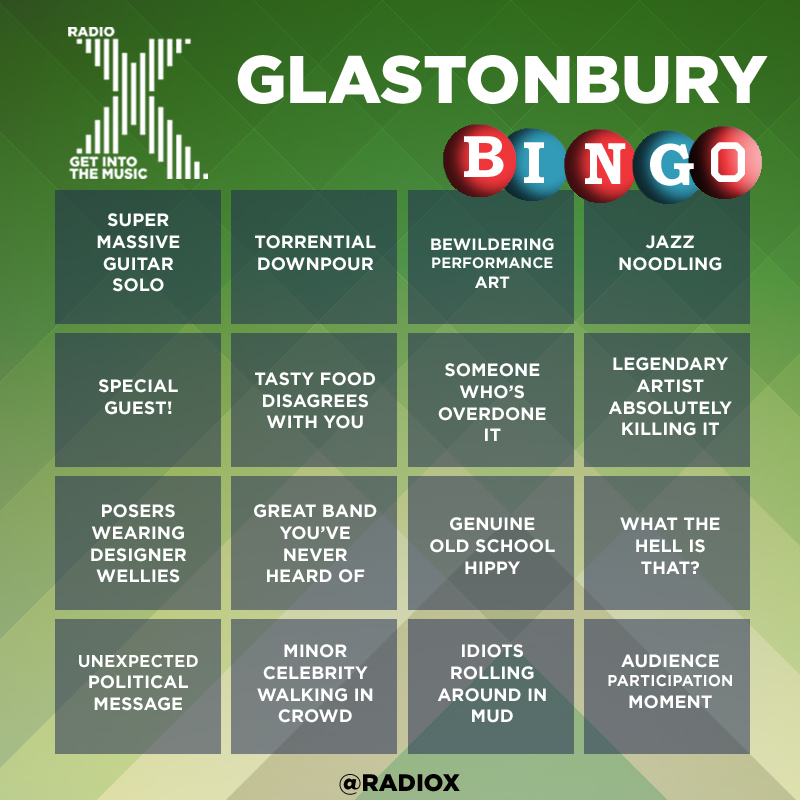 Let’s play Glastonbury Bingo! Whether you’re in the thick of it, camping rough and loving it, or sitting at home, watching on the “red button”, play along and cross off a square when you see one of the choice moments. In honour of multiple headliners Muse, The Who and maybe even this year’s star Big Dave Grohl. Extra points if the rest of the band stop to let the guitarist do their thing. Might not be such a sure thing at 2017’s festival, but hey - it’s June in Britain, anything can happen. It could be on one of the main stages, it could be wandering around the crowd, if it makes you stop and think ‘What the hell’s THAT all about’, chances are it’s performance art. AKA extended solos. Often found at some of the more “specialist” stages, it could happen right in the middle of a headline set. We’re looking at YOUm Radiohead. Focus on Ed Sheehan on Sunday night. Bookies have put 1/6 odds on Stormy turning up, with Taylor Swift 2/1. Both Harry Styles and Ellie Goulding are 6/1 with veteran ivory-tinkler Elton John at 8/1. Or, the “Glastonbury belly”. We’re all for a culinary adventure, but know your limits. Bonus points if they’re an artist performing a set. Bee Gee Barry Gibb is a shoo-in, but keep an eye out for Kris Kristofferson, or event Kiefer Sutherland. Maybe even The Jacksons? Despite record temperatures on the Wednesday, this will still happen. Keep an eye on that John Peel Tent! Even though it’s “gone corporate”, Glastonbury still has that history, man. Bonus points if they’re totally naked. It could be a person. It could be some kind of stage set. If you can’t make head nor tail of it, its a CROSS for that box. To be honest, we’re expecting a lot of this in 2017. But check the box off if it’s from an unlikely source. Sheeran’s got to do something, surely. Johnny Depp - not applicable. Kiefer Sutherland - not applicable. One of the Chuckle Brothers - CHECK. Will be scarce this year, but someone will find something to make themselves grubby with, don’t you worry. Shudder. Maybe not Radiohead, but if they unleash Creep, yes. Foo Fighters - deffo. Sheeran - absolutely. Katy Perry - God knows. GOOD LUCK - AND DON’T FORGET TO SHOUT “GLASTOOOOOO!” IF YOU GET A WHOLE ROW!